Company Energo Plus d.o.o. has a long-term tradition in the Slovenian market which stands for reliable supplier of air conditioning, heating and ventilation equipment. In the last 25 years, we have supplied the HVAC equipment for some of the most important new buildings in Slovenia. We cooperate with the users of this units through signed maintenance contracts and offer them additional optimisation of running costs and reliable functioning if the installed units. By keeping wide range of spare parts at our warehouse, we guarantee fast supply and installation of original spare parts for units of different manufacturers. ​Energo Plus d.o.o. is official authorized supplier of spare parts for some of the largest world producers of chillers and other HVAC equipment, such as Carrier, McQuay (Daikin) and other manufacturers we closely cooperate with. The field of air conditioning (air conditioning and ventilation units, chillers…) is demanding and expert field which demands proper preventive maintenance in order to keep low long term expanses and proper functioning of the units. HVAC systems represent in average approximately 11% of the construction costs. 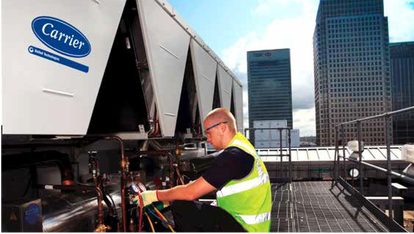 Proper preventive maintenance of the HVAC equipment is very important since these systems are very complex and are based on engineering principles. All these usually exceeds the basic knowledge of the operators and maintainers. We at Energo Plus d.o.o. are aware, the professional expertise of our service engineers is very important so we regularly perform professional training, which is also verified by Slovenian environment agency (ARSO). We offer our clients several preventive maintenance packages for the whole HVAC systems or individual HVAC units. Preventive maintenance prolongs the life span of the equipment. Preventive maintenance lowers the running costs. Positive experiences of our clients. Preventive maintenance lowers the energy costs. Preventive maintenance is the most cost efficient. Preventive maintenance enables quicker response. Preventive maintenance guarantees that the service team is always in standby. Our company also performs mechanical and electrical installations both for our contractual clients and on open market. Our trained team of professional experts with many years of experience has the know how to perform even the most demanding electrical and mechanical installations in different constructions - from industrial buildings, commercial and public buildings as well as schools, hospitals and so on. Overview of the implementation documentation by a professional, which includes detecting possible faults in the project documentation and eliminating these faults with proper solutions even before the initiation of the works. Preparation of detailed time schedules for completion of construction works. Coordination of the subcontractors on the construction site. Fast and professional adjustment and proposing of good technical solutions at performing works on the construction. Accurate and ongoing management of work diaries. Correct relation between subcontractor, main contractor and the client. Managing and coordination of the complete project with our own team. Preparation of projects for implementation of construction works. High quality execution of the ordered works considering the defined extend of the works and the defined time schedule taking into account the demands of the client. Inspection of the current condition of the units and systems installed (cooling, heating, air conditioning and other systems). Measuring and monitoring of the existing systems. Technical consulting with the investor regarding the replacement of old, energy wasteful systems with new, energy efficient systems. The cost analysis and eligibility of investment in new, energy efficient systems. Calculation of the repayment of investment in new, energy efficient systems. Helping investors to decide on installation of new, energy efficient and reliable systems. Outline scheme and basic design of new systems. Preparation of all the necessary project documentation according to Slovenian laws. Preparation of calculations for all sorts of units and systems (heating, cooling, air conditioning…) for all types of buildings. Preparation of tenders according to prepared project documentation. Execution of mechanical and electrical installations. Management and supervision of the works performed. Initial startup to guarantee that systems installed work optimally and flawless. Performing settings and measurements of the systems and units during their warranty period and after its expiration. Maintenance and servicing of the units and systems installed. Beside the activities listed above we also perform complete engineering services for new industrial, commercial, public, residential and other buildings in Slovenia and abroad. Advantages for the client, investor and user of the building by executing a complete system solution for heating, cooling, air conditioning and other energy systems are in well-organized system of monitoring of the performance of existing systems, knowledge of systems that we maintain and service, in precise and regularly recorded service interventions on the units and systems and also in good knowledge of the actual condition of the systems and units installed.